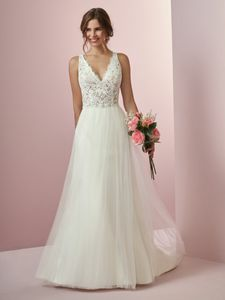 Description: This boho wedding dress features a sheer bodice accented in allover lace, with straps gliding from V-neckline to illusion back with keyholes. An attached beaded belt accented in Swarovski crystals completes the tulle A-line skirt. Finished with pearl buttons and zipper closure.